When you invest in a rental property, one of the most effective ways to ensure that managing it does not become a time-consuming and challenging task is to keep the tenants happy. When you have satisfied tenants, they are apt to pay rent on time, respect the property and remain onboard for as long as possible. All of these factors can save you from a multitude of potential headaches and costly expenditures. One property manager at the global real estate company Jones Lang LaSalle (JLL), recently implemented a simple and affordable means to help keep tenants happy! At Mill Green, a commercial office building located at 5 Mill Street in Perth, the managers at JLL introduced outdoor bean bags. These were used in the ground floor common areas so that employees and workers can relax in comfort. Mill Green is situated away from the street across from the Hilton hotel, and it has a large outdoor plaza on the ground floor. Retail business and offices are also on the ground floor while the upper ten levels comprise of even more offices. The exterior and interior of the building and the surrounding grounds were refurbished in 2013, and as a finishing touch on that project, the outdoor areas were made to be as comfortable for the tenants as possible. 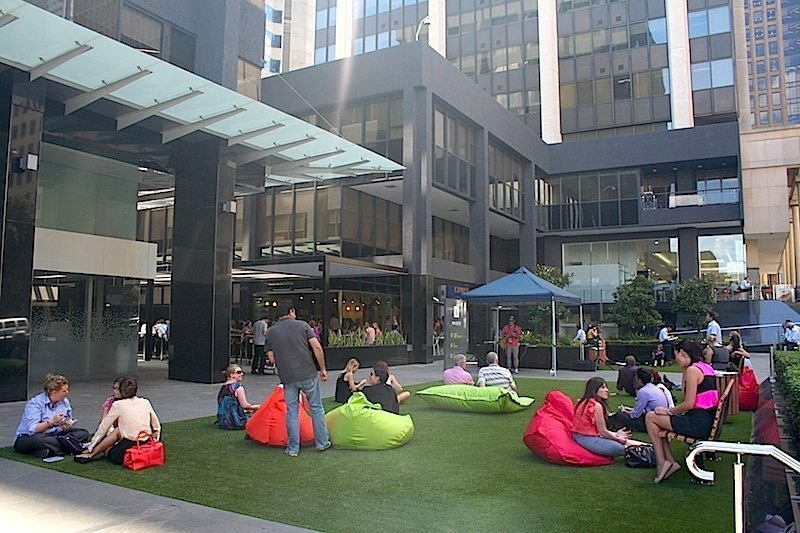 The climate in Perth allows workers to relax outside for lunch and other workday breaks, so JLL decided to enhance the outdoor plaza with bean bag chairs. The bean bags have been added to the outdoor spaces and meeting areas. Not only does this provide a comfortable place to sit but also to add some colour to the plaza rather than the greys, browns and blacks that are typical of outdoor furniture. The particular colours used include red, blue, orange and lime. Three different models of bean bag chairs were purchased: the Big Boppa and the Freaky Cousin, all of which are available online from Bean Bags R Us. The virtues of bean bag chairs and other bean bag furniture are quickly spreading across all walks of life and nearly all settings, including homes and businesses. Several technology companies in Silicon Valley are already using bean bags for their employees because they are comfortable, durable and ergonomic. Many IT workers and office staff now use laptop computers instead of desktops, which has created a new dynamic. Laptops are not as ergonomically friendly when used in conjunction with traditional desks than with other types of furniture. Following the introduction of bean bags to offices, employers have documented improved comfort and productivity. One major company that firmly believes in the power and benefits of bean bags is Google. Google uses the furniture liberally in its offices and outdoor areas, and this has prompted one dealer to design bean bag chairs with a full-size Google Chrome logo. • Ergonomic – Bean bags are entirely ergonomic. They are pliable enough to conform to the natural curves and weight of the body and firm enough to hold the position once a person sits on one. When sitting on hard furniture while performing repetitive motions, many workers begin to experience headaches, joint pain or back pain, but bean bags reduce tension, stress, and anxiety. • Easy to maintain – Bean bags are incredibly durable and require very little maintenance. Also, they do not need assembly and are easy to clean. • Portable – Bean bags are lightweight and can be repositioned without any special equipment. • Safe – Bean bags are soft, so it is difficult for anyone to injure themselves on them. • Affordable – Quality bean bags can be purchased at a fraction of the cost of traditional furniture. If you are seeking ways to make your tenants happy, outdoor bean bags are worthy of consideration.